The headland known as Le Catioroc makes the south end of Perelle Bay and features Le Trepied Dolmen. Guernsey is extremely rich in old stories and legends concerning witchcraft and devil worship. If a dolmen featured in an old legend or folk story it was nearly always this one. At the beginning of the seventeenth century Le Catioroc was noted as being the midnight haunt of the witches and wizards during the witchcraft trials held under Bailiff Amias de Carteret who was in office 1600-1630. In mockery of the shrine of Notre Dame de Lihou on the island of Lihou. As recently as the last century this place was strictly avoided by a superstitious population as the weekend got under way. It’s a shame really that the area is famous for something that only happened in the last 400 years. The building that we are here to visit could have been in place for at least 10 times that. 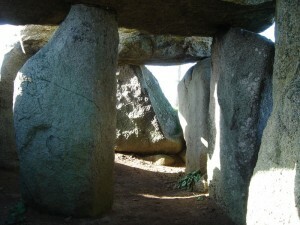 However, these superstitions have helped preserve this passage grave (Le Trepied Dolmen), one of only four left in this area. The visitor to this site will see that it is in plain view of both Le Crocq at Richmond and also the Creux ès Fees so this headland is the centre one of three prominent sites on the west coast of Guernsey. The site was excavated by F.C. Lukis in 1839-40. He recovered human bones, some beakers and arrowheads. His son restored the collapsed western capstone (below) though this and its support went again in 1920 when it was further restored. Maybe the capstones had been knocked down in order to force ‘Barberie’ to go elsewhere for his Friday night entertainment? The whole area here is littered with stones, some obviously buried and some seemingly scattered. During my visit, horses were being kept in the field alongside the dolmen and a makeshift tape fence ran very close to it preventing a full photo of the site. 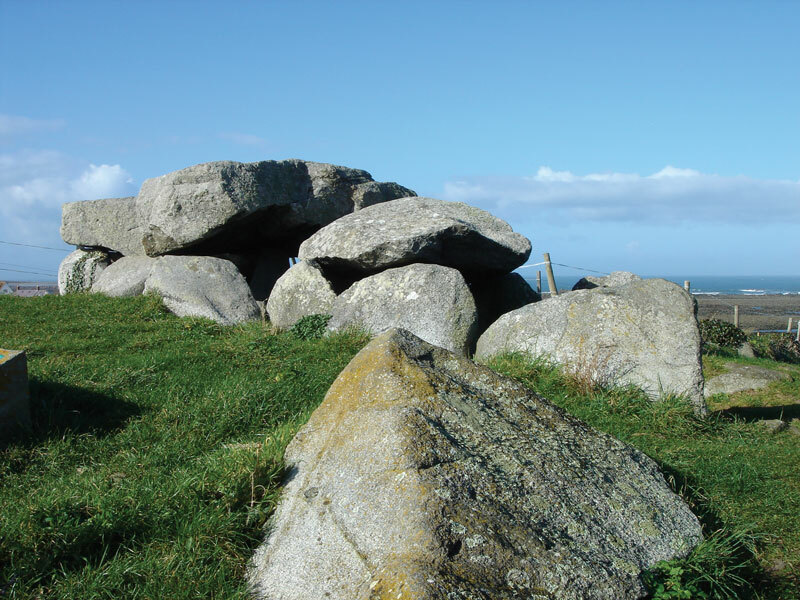 It is clear that there was a lot going on during the megalithic period and the area has been often claimed to be a ‘stronghold of Paganism’ in the island. Maybe the area will be investigated more thoroughly one day.